Support a standing sculpture, scarecrow, or other décor in your yard in moments with this Anchor Post with Integrated Ground Auger. This robust, solid steel anchor adds stability to a bevy of outdoor standing items, while installing in moments. Its significant, 5" long, bottom auger screws into garden soil, creating a deep support for your ornament. A 4.25" wide, horizontal rod acts as a handle, aiding installation, and then rests flush with the ground. 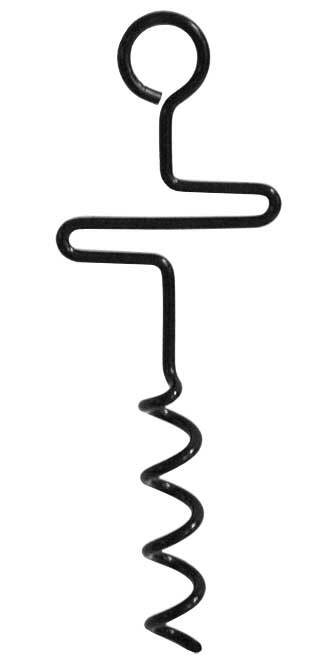 This also provides a touch of design to the item, and the steel then extends 3.25" upward and culminates in a top loop. This circular opening holds your tent rope, scarecrow, or banner base easily. The added horizontal support keeps the anchor deeply in the ground, preventing it from being pulled upward, and the black, powder coated finish offers a classic look. Its solid steel construction provides both longevity and strength, while the convenient size works in a wealth of yards. Keep your upright garden décor solidly in place with this Anchor Post with Integrated Ground Auger. Availability: 124 in Stock. Ships from OH within 24 business hours , 124 available at this price!